The plots shown in this tutorial were created in R using output generated by Marxan Connect. In this example, we automate the iterative runs of Marxan using R to facilitate the process. Here we create a connectivity matrix which contains flow data. This step is not necessary if you have your own data. In this example we used the above flow matrix to generate conservation features in Marxan Connect. We appended those conservation features to the existing Marxan files. To replicate this process either follow the “Demographic Data using CF” tutorial or load and modify the targettradeoff.MarCon project file. 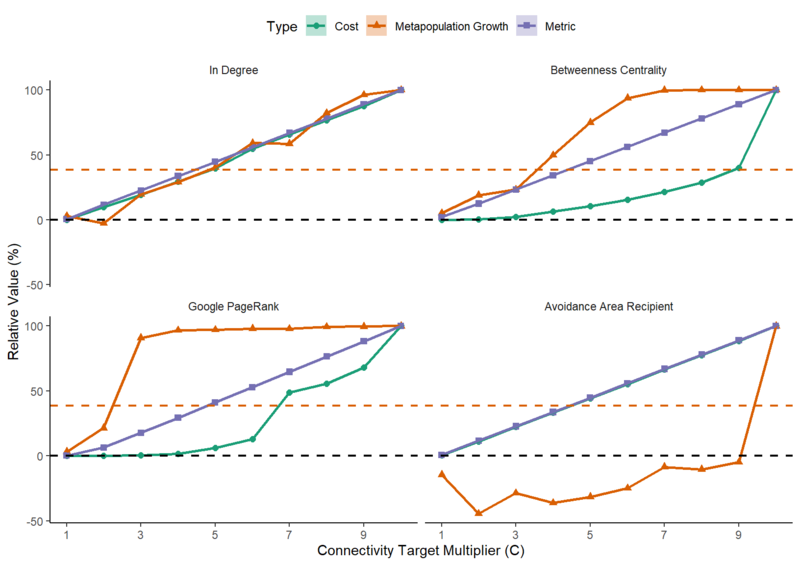 Using R to run Marxan allows us to run Marxan including 1 connectivity related conservation feature at a time, and with varying values of the Connectivity target multiplier (C). C is a tunable ‘contraint’ which scales the targets for connectivity based conservaton features relative to that of normal conservation features. First let’s prepare all the parameters. Now we can iterate Marxan. If you’re using the the RMarkdown .Rmd version of this tutorial, you may want to remove the eval=FALSE in the R chunk options since this chunk of code won’t run if it’s still there. It’s there to prevent the lengthy iterations of Marxan when building the website! That ecologically relevant conservation objective step is very important. Here we calculated the metapopulation growth of a flow matrix that includes survival and mortality using the first eigenvalue of the matrix. Our conservation objective in this case is to have a self-sustaining metapopulation inside the reserve network (i.e. in-reserve network metapopulation growth rate > 1). Please note that this is not the only possible conservation objective, or even the only way to calculate metapopulation growth. This example is for demonstration purposes only. Please see Shima, Noonburg, and Phillips (2010),M. Drechsler (2009),Kininmonth et al. (2010),Day and Possingham (1995),Figueira and Crowder (2006),Hanski and Ovaskainen (2000),Etienne (2004) for more information on ecologically relevant conservation objectives. metric == "Avoidance Area Recipient"
And finally, let’s see the results! Day, J R, and H P Possingham. 1995. “A Stochastic Metapopulation Model with Variability in Patch Size and Position.” Theor. Popul. Biol. 48 (3): 333–60. Drechsler, Martin. 2009. “Predicting Metapopulation Lifetime from Macroscopic Network Properties.” Math. Biosci. 218 (1): 59–71. Etienne, Rampal S. 2004. “On Optimal Choices in Increase of Patch Area and Reduction of Interpatch Distance for Metapopulation Persistence.” Ecol. Modell. 179 (1): 77–90. Figueira, Will F, and Larry B Crowder. 2006. “Defining Patch Contribution in Source-Sink Metapopulations: The Importance of Including Dispersal and Its Relevance to Marine Systems.” Popul. Ecol. 48 (3). Springer: 215–24. Hanski, I, and O Ovaskainen. 2000. “The Metapopulation Capacity of a Fragmented Landscape.” Nature 404 (6779): 755–58. Kininmonth, S, M Drechsler, K Johst, and H P Possingham. 2010. “Metapopulation Mean Life Time Within Complex Networks.” Mar. Ecol. Prog. Ser. 417. Inter-Research Science Center: 139–49. Shima, Jeffrey S, Erik G Noonburg, and Nicole E Phillips. 2010. “Life History and Matrix Heterogeneity Interact to Shape Metapopulation Connectivity in Spatially Structured Environments.” Ecology 91 (4). Wiley Online Library: 1215–24.